The locusts are coming! No, wait. Theyâ€™re already here. Or they are still here, I should say. Just when you thought that all of those evil American imperialistic McJob McGlobalizers had already sucked the life blood out of Germany and must have moved on to greener pastures down south (out east?) by now, word leaks out that US companies are continuing to invest heavily here. 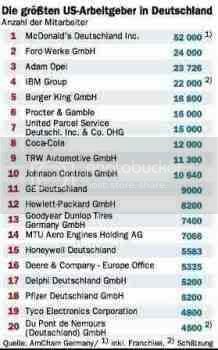 According to an American Chamber of Commerce survey, a top 50 list so-to-speak, US firms are still pumping billions into Germany and directly employ over 800,000 people here, many of these actually believed to be so-called â€œGermansâ€ themselves. Global Empire of Evil flagship McDonaldâ€™s employs most of these powerless, walking dead McZombies, of course, but it is closely followedÂ by other American bloodsucking exploiteurs like Ford, ExxonMobil, IBM, Coca-Cola and Hewlett-Packard. Many concerned German politicians now fear that these jobs are here to stay, too, most of these companies already having the biggest part of their relocation and downsizing process behind them. And to complicate matters even further, many American managers have an inexplicably positive view of Germany at the moment. They are under the mistaken impression that the Germans have somehow managed to â€œreform their systemâ€ and have â€œpulled themselves back up by the bootstrapsâ€ again. Stupid capitalist swine. No mass protests are planned for the moment, but grassroots citizen groups have begun collecting signatures in the vain hope of fending off the money-hungry Geld geil (money hungry) ghouls before it is too late. But itÂ already is much too late, of course. Stupid anti-capitalist swine. No user commented in " Locusts Without End "